It certainly won't be an exaggeration if I say every business out there is on social networks. Social media presence demands reasonable amount as investments. Companies are said to hire dedicated social media managers to handle their wide account portfolio on different networks. These managers are responsible for providing updates to the world about company's initiatives and also take up activities like solving customer issues. Numerous success stories can be found on how small companies made it big with the help of social media. These days social media like twitter form the core of every revolution around the world. Inspired by the way public opinions can be measured, Government agencies are also not left behind in joining the social media bandwagon. Celebrities are everywhere with huge number of followers! This article tries tries to provide some insights into how notable GIS and mapping companies are tapping social networks, with focus on twitter. Here is a list which takes you to twitter knowledge gateway. Esri - Esri needs no introduction as a GIS company. It is probably the most active GIS Company on social media. They maintain over 25 active twitter accounts. Esri seems to have a well-defined social media strategy in place. Esri has country specific and portfolio specific accounts. In addition to these, they have separate accounts for Support, training, Esri press, careers etc. Several of their employees are also on twitter. Followers of these accounts will be able to stay updated on current happenings across Esri domain - new software releases, customer success stories, upcoming webinars, events and a lot more. In addition to being active on social media, Esri websites can be a single source of information for a wide variety of topics on GIS. Regular reading of Esri blogs will enhance one's knowledge about applications of GIS to a great extent. Then there are blogs like geoXchange, managed by Esri employees. For a knowledge seeker, GIS.com managed by Esri, will prove to be a valuable learning resource for GIS. In totality, Esri along with building business also brings value to GIS domain as a whole. 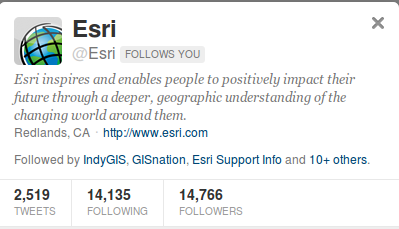 No doubt their offerings are expensive, but for a GIS Student Esri will always be a preferred learning resource. Safe Software - Safe software, the Canadian company, renowned for FME Spatial Data Transformation platform, uses twitter to let followers know about innovations in its products, announces new releases, upcoming webinars, announces small contests and lot more. Safers are tech savvy, as the founders themselves are on twitter (@donatsafe and @daleatsafe). Here is a sample @SafeSoftware tweet. HexagonAB - Hexagon group companies (Intergraph, ERDAS, Leica Geosystems etc.) update you about product releases, blogs, upcoming webinars and events. PCI Geomatics - Fairly active on twitter, updates pertain to products, company's social responsibility activities, tutorial video links, responding to queries etc. Bentley Systems - Bentley tweets about customer success stories, events, upcoming webinars etc. GIS Cloud - The fast growing GIS Cloud services provider, GIS Cloud, provides occasional updates about innovations - theirs as well as related ones. DigitalGlobe - This leading satellite imagery provider, keeps you updated on how satellite imagery is put to use around the world. Pictometry - I started following them recently. Pictometry updates you with the potential of their bird's eye imagery, advertises job openings, provides links to success stories etc.